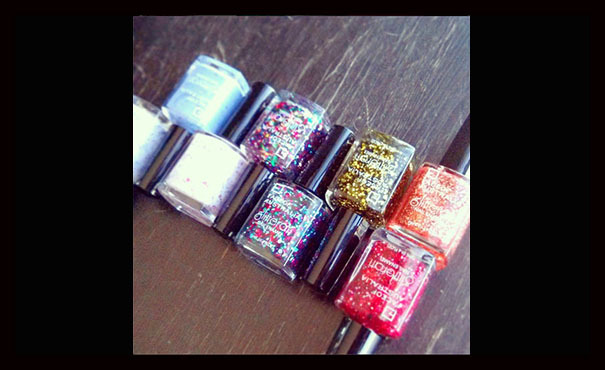 On Friday, I was sent a number of gorgeous, jaw-dropping glitter polishes, courtesy of Face of Australia. If you follow my Instagram, Twitter or Facebook accounts, you'll know that Face of Australia releases some absolutely fantastic limited edition nail polishes, and this one just tops the cake. Studio 54 and Lookin' For Some Hot Stuff - multi-sized glitter suspended in a clear coat of polish. These are beautiful on their own or over a darker polish. Dancing Queen, Disco Inferno and Saturday Night Fever - uniformly sized, multi-coloured glitter suspended in a clear polish. These would look absolutely amazing over black nail polish. Boogie Wonderland, Funky Town, and Heart of Glass - glitter with different shapes and sizes, suspended in creamy pastel polish. So pretty on their own. Overall, I found these glitter polishes to be easy to apply, and they dry very smoothly as well. I didn't apply a top coat over my nails but I still found the surface of my nails to be relatively smooth, with minimal snagging. Remember that with glitter nail polishes, you will need to be patient when it comes to removal. It can be difficult and time consuming, but for me it's worth it! Disclaimer: These products were sent to this blog for the purposes of review and consideration, in accordance with this site's Disclosure Policy.